Item007 - General view at Lake Massawippi, P.Q. Item009 - Regata day on Massawippi Lake, North Hatley, P.Q. Item014 - View of the Harbor and the Boston & Maine Bridge, North Hatley, P.Q. Source of title proper: Title appears on postcard. 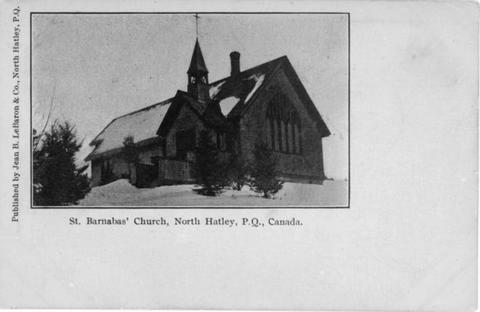 The item is a postcard showing the St. Barnabas Anglican Church in North Hatley from around the 1900s. Postcard also available in digital format.